Blazeguard Fire-Rated Sheathing was chosen for a luxury duplex project built by Cottage Builders in Mankato, MN to meet the International Building Code requirements for fire-rated materials in the roof deck of Type V Multifamily Construction. Along with its fire-retardant properties, Blazeguard is a non-hazardous, non-combustible material that releases water upon the heat of fire - not harmful chemicals. Blazeguard as used in the roof deck of the multi-family structure. To read more on this project click here. The Museum of Science and Industry in Chicago, IL currently has a unique exhibit - a "Smart Home: Green + Wired". 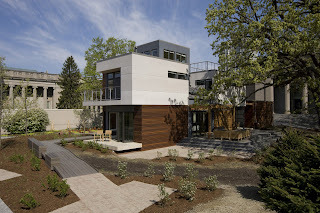 This exhibit is a real, functioning three-story modular and sustainable "green" home - built in the Museum's backyard. The home focuses on reusable resources; smart energy consumption; and clean, healthy living environments in a contemporary setting. Barrier Technology teamed up with Mule-Hide Products to donate panels of our Blazeguard product - the Mule-Hide FR (Fire-Rated) Deck Panel for use in the roof deck of this building. Our product fit perfectly with this project for many reasons: a fire-retardant building material that is non-combustible, ignition resistant, non-hazardous, that releases water - not chemicals upon the heat of fire. Barrier is proud to provide environmentally friendly products that protect people and property from fire. 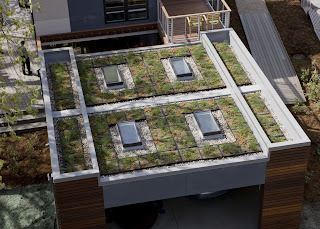 Barrier Technology's Mule-Hide FR Deck Panel lies beneath this "green" garden roof seen from above. This past weekend, Barrier Technology participated in the local town festival, "Kraut and Wurst Days". For those of you not from the area - the celebration is named after a favorite German summer snack - Bratwurst and Sauerkraut! As a member of the community, Barrier team members and family were proud to participate in the festival promoting Blazeguard Fire-Rated Sheathing while handing out candy/freezies on a gorgeous summer Minnesota day.